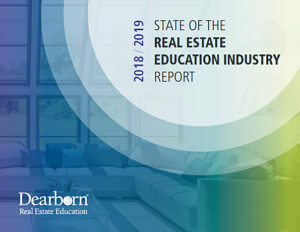 The State of the Real Estate Education Industry Report, 2018-19 captures the sentiments of 347 real estate schools who participated in Dearborn’s annual survey. It also compares them to the responses from the 2017–2018 survey. A big difference between the two surveys is training delivery methods—online versus classroom—with a 40% drop in the number of schools that only offer classroom training compared to 2017. And, the number of online-only schools jumped almost 7% to 15%. Meanwhile, nearly 90% indicate that competing with low-cost online providers is either challenging or very challenging to their business. In a world where experts claim that students demand more interactive online learning on their mobile devices, should you add more online classes and dispense with classroom training? Although you might think the answer to that question is “yes,” it’s really “maybe.” In our survey, few educators indicated they were going to go completely online, choosing instead to say that by 2023, they would have up to 44% of their training online. This is an indication that classroom training is still viewed as key to a real estate school’s success, despite concerns over low-cost, online-only competitors. Those who offer classroom training should capitalize on its inherent advantages that can’t be duplicated in an online environment. With education experts emphasizing what seems like an insatiable demand on the part of students for “bite-sized eLearning” on their smartphones and tablets, along with a significant decrease in attention span, it’s easy to think that classroom training is becoming less popular. The responses in the State of Real Estate Education Report in fact reflect a growing concern over how students today learn and how they want to get their training. The good news is that classroom training still has many advantages to offer students. For one, studies show that students retain more of their new knowledge and skills when they learn from an instructor who is in the room and directing a continuous flow of information. Students who pass the licensing exam on the first try are more likely to return for continuing education or coaching, and they can be an excellent source of referrals to their peers. An even bigger advantage is relationship building. After all, real estate is a career based on personal relationships. Real estate agents and brokers become advocates for their clients in the process of buying and selling property. They have to be able to establish trust and confidence. So, even though prelicensing education is ultimately about earning a license, the classroom experience starts the relationship building process early. Students get individual attention almost immediately and learn to give it. Discussions in the classroom encourage the natural give-and-take needed for a successful real estate career. Here are some things you can do to ensure your classroom training is something that can’t easily be duplicated online. The best way to make sure your classroom training stands out is to deliver what the students want. Survey some former and current students. Go to high schools or technical schools and ask students interested in a real estate career what they would like to see in a real estate classroom. Take note of the answers. Then, work with your instructors to make changes in your offerings or curriculum so they address student preferences for delivery and content, such as more discussion, more visual aids, question-and-answers, and “instructor for a day.” By applying your knowledge of what students want from instructors and classrooms, you will be able to deliver outstanding classroom training. Now more than ever, real estate students come in all ages, and they don’t all learn the same way. Look at the tendencies of each generation and begin to develop a strategy for effectively reaching all of them. When instructors are able to teach students of all ages in the classroom, it has a powerful effect on the perception of the training and your school. Why? It will be viewed as versatile and able to meet the needs of any learner. This article has tips on how to build these strategies. You can get more details about these traits in this article. There are also resources available to equip them with what they need to become outstanding instructors. With an abundance of emerging education delivery methods, it’s easy to start thinking that you should focus on the new ones at the expense of the old. Certainly, you should keep up with trends and branch out; we’re not disputing that. But, the human element is still the part of your school that can make it stand out. When classroom training becomes your competitive differentiator, you have upped your game and can ride out any wave in the industry. Quality classroom education will never go out of style.